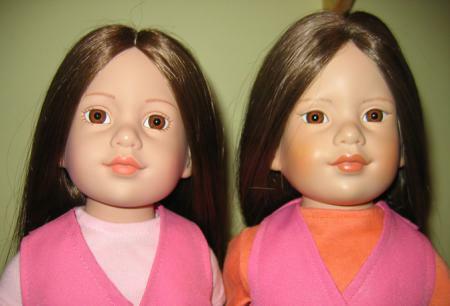 The very first Magic Attic Club dolls, introduced in 1994, have a slightly different face mold than later dolls. The first release dolls have smaller eyes. You can identify an original mold dolls by their eye painting: 1994 dolls have ten lashes painted below their eyes and all other years have five. The picture is Heather from 1995 on the left and Heather from 1994 on the right.